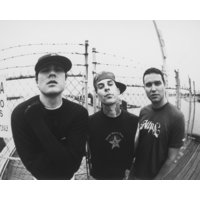 Blink-182 is an American pop punk band consisting of vocalist and bass guitarist Mark Hoppus, vocalist and guitarist Tom DeLonge, and drummer Travis Barker. They have sold over 35 million albums worldwide since forming in Poway, California in 1992. With original drummer Scott Raynor they released their debut album Cheshire Cat in 1994 and achieved moderate success with its follow-up, 1997's Dude Ranch, which went on to sell over one million copies. Raynor was replaced by Barker midway through a 1998 tour. The band achieved greater success with 1999's multi-platinum selling Enema of the State, which reached #9 on the Billboard 200 on the strength of the singles "What's My Age Again" and "All the Small Things", the latter of which became the highest-charting song of their career by reaching #6 on the Billboard Hot 100. Blink-182 gained popularity for their irreverent sense of humor, and the follow-up album Take Off Your Pants and Jacket (2001) reached #1 in the United States, Canada, and Germany. The eponymously-titled Blink-182 followed in 2003 and was a stylistic shift for the group, infusing experimental elements into their usual pop punk formula which resulted in a more mature sound. DeLonge left Blink-182 in early 2005, sending the band into indefinite hiatus. He went on to form Angels & Airwaves while Hoppus and Barker formed +44. Blink-182 reunited in February 2009 and are currently recording a sixth studio album.